Hi Friends: It's time for the launch of a new stamp set from JessicaLynnOriginal stamps. 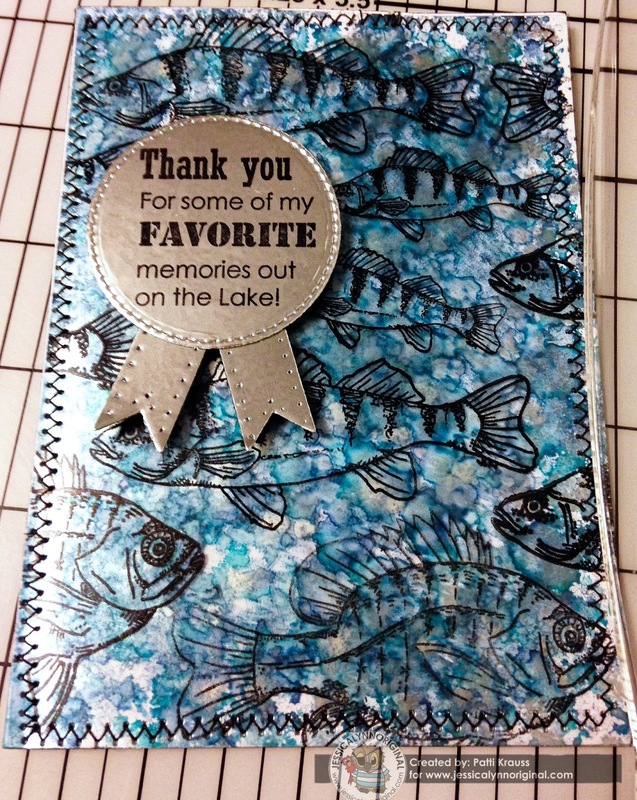 This is a terrific set of stamps called Fishing At Phantom Lake Wisconsin Happy Father's Day Fish, and it has the perfect images for all the men in your life that love to go fishing. I think it's a perfect masculine stamp set for birthdays, Father's Day, and any day that you want to show your love to your men-folk. This stamp set is available at pre-launch pricing until April 22nd at a discount of $2.65 off the regular price. Here's a picture of the full stamp set - don't you just love all these great masculine images? We would love to see what you do with this set, if you want to post them up on Jessica's Facebook page. Visit all of my design teammates and see what else they've done with this fun stamp set. Don't forget, if you decide to purchase any stamps or digis from the store, please remember to put my name in the instructions/comments section during checkout. See below for instructions and supplies for my card. Hope you have a great crafty day! Stamp fish randomly on A2 size piece of acetate/transparency using StazOn ink to create a full background of swimming fish. On the opposite side of the acetate, use Alcohol Ink applicator and blue and silver inks to create the watery background behind the fish - just pounce the applicator around the acetate to create this gorgeous effect. Sew the background to an A2 card base. To create the sentiment badge, cover a piece of scrap cardstock with aluminum tape and use the banner and small stitched circle die to cut the pieces out. Use the piercing template to add stitched edges to the banner and cut it in half. Stamp the sentiment onto the circle with StazOn ink. Add the banner pieces to the circle to create the badge, then add to the card front with foam squares.